Chicago Bulls took down the Boston Celtics in their season opening fixture thanks to a spectacular debut for Dwyane Wade, part of a new-look side who made a statement in the Eastern conference. 22 points for the new signing, coupled with 5 assists while Jimmy Butler scored 2 more resulted in the hosts leading from the outset, with Rajon Rondo also on the backcourt dishing out 9 assists. Isaiah Thomas was atop the scoring charts for the whole game with 25, but saw his side denied by a team who proved their shooting credentials in front of a home crowd. After winning the tip, Chicago embarked on an excellent opening to the game by racing ahead to a 10-point lead to force a Celtics' timeout some 5 minutes in. Jimmy Butler nailed a smooth three-pointer from the corner as the backcourt fluidly got the ball moving, and looking good on defence as Rajon Rondo began his tenure at the club with a steal and conversion. The success of the point-guard would continue as the hosts' finished the first 12 minutes strong against the team where he won a championship in 2008. The 10 point lead would be preserved going into the second quarter, with Wade and Butler taking 5 each while Lopez and Gibson, heavily assisted by Rondo, took one more. Chicago were in full control as they lead 30-20 after the first. 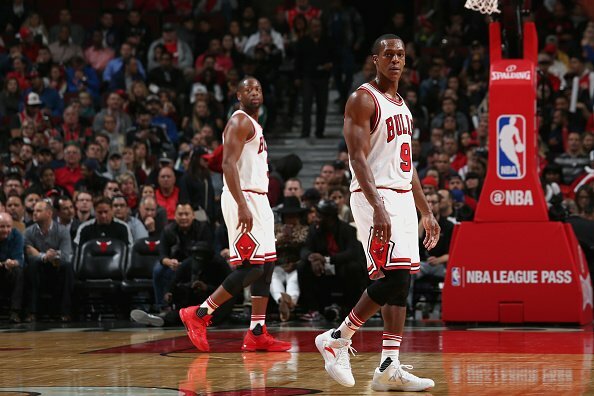 In the second quarter, the Bulls continued to enjoy life from beyond the arc, or in Dwyane Wade's case, extremely beyond, as the former Miami man got a shot off from downtown marginally inside the allotted shot clock. He and his fellow guard were also dishing out a mass of assists, while Celtics - having defeated Nets in their opening game - still looked sluggish. Jimmy Butler seemed content with how things were going, although it could have went south after an incident with Crowder. Looking to take a charging foul, he appeared to trip his counterpart and that lead to Isaiah Thomas getting involved in some heated discussions, and a handful of technical fouls being distributed. Even though they were unable to take the lead for the first time in the game, Boston did find themselves warming up midway through the second quarter, thanks mostly to Avery Bradley's 12 points and Thomas' 11. They made up some ground to go into half-time trailing by 8, but the 7 for 13 shooting from the Bulls is what really stood out following 24 minutes of action. With a lot of debuts going on for both sides, Al Horford made sure he wouldn't be forgotten with a block on Butler in the first half and then a stunning play early in the third quarter. He brought the ball up, set a pick, took the pass then found his open teammate for the conversion. That was part of a string of strong scoring as the Celtics suddenly made this more of a ball game than anyone in the United Center expected. A 14-3 run to open up, with 6 straight field goals made it a one point game with around 18 minutes of basketball left on the clock. Some more three-pointers and a jump shot from Butler helped dig the Bulls out of that small dip, reinstating a solid lead going to the fourth quarter. 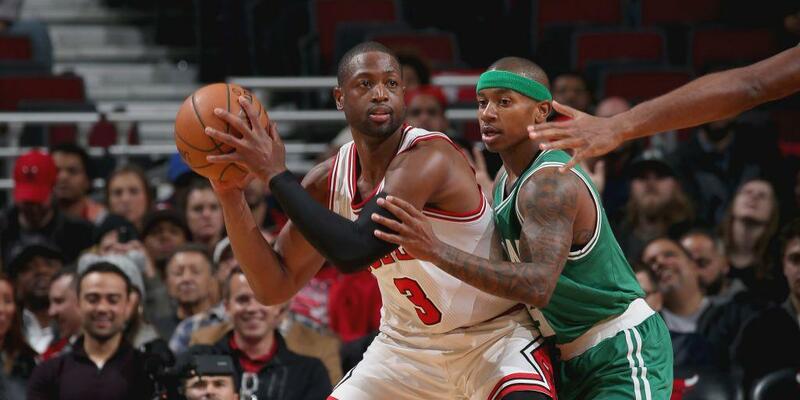 Despite Thomas' best efforts for the visiting side, the Bulls were up 79-73 and still looked comfortable. However, it turned out to be far from nipped in the bud when, in the thick of the fourth quarter, we still had a game on our hands. Boston were continuously getting on short runs to chop the lead down, but the Bulls were just doing enough to keep away. A 16-4 run towards the latter minutes featuring two successful free throws from Crowder made it a two-point game, although when Horford missed a three-pointer to give the Celtics the lead, the previous scorer would foul and make it a two-possession game thanks to Butler's free-throws. A costly turnover from Brown when it was back down to a two-point game at 101-99 would be cruelly punished by an ice-cold Dwyane Wade, nailing a three point dagger with less than half a minute left to put his side on the home straight. Even with traffic in front of him, and appearing that he didn't get the best of shots off, the ball found its way into the bucket. He followed that up by forcing a turnover from Green, and Butler converted one of his two free throws, with Celtic unable to do any further work. 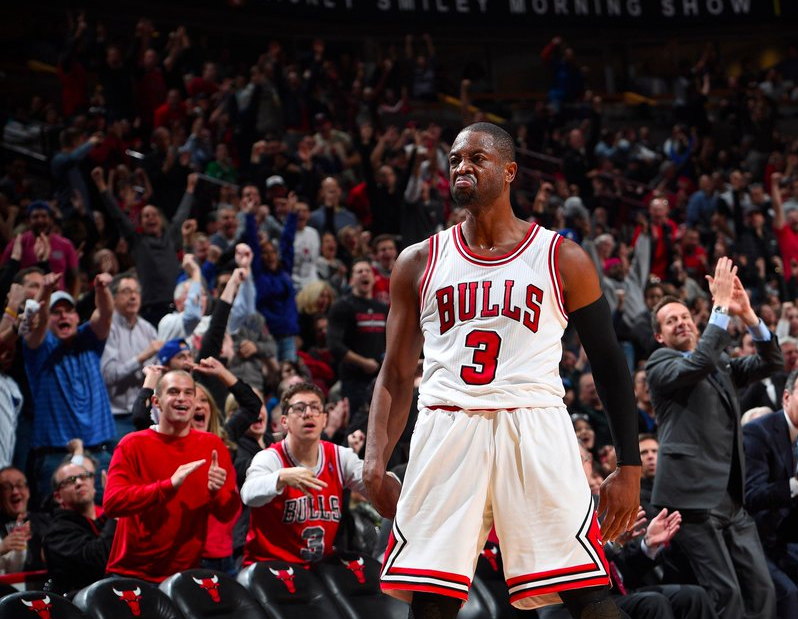 Butler finished the game grabbing the rebound and dribbling it out as Chicago kicked off their campaign in style.